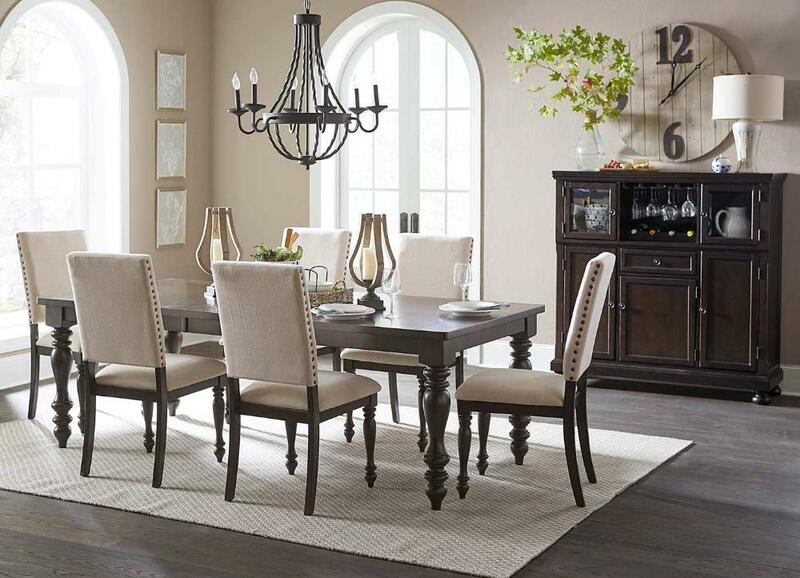 Casual transitional styling lends versatility to the placement of the Begonia Collection in a number of dining room settings. The gray finish and traditional styling of the table, chairs and curio, lends distinctly to the execution of different looks from traditional to country casual. Knob hardware punctuates the look of each framed drawer on door front on accompanying server. Behind door glass display storage and wire glass rack provide additional functionality. Neutral toned fabric chairs perch atop turned legs and feature nail-head accent that serves to define the chair's back profile. FEATURES: Gray Finish ~ Transitional / Traditional Style ~ Butterfly Leaf Table ~ Neutral Toned Fabric Seats ~ Turned Legs / Nail-Head Accents ~ Curio Behind Door Glass Display Storage / Wire Glass Rack ~ Knob Hardware.